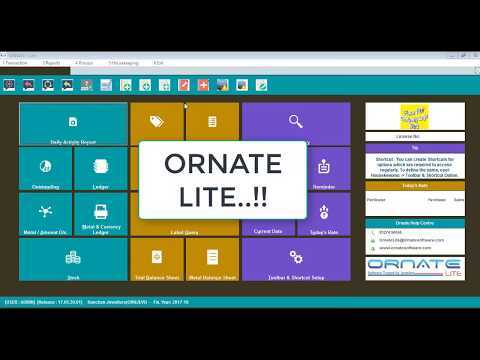 ORNATE-2014 allows a Wholesaler to manage this function very well through the Wholesale entry. Whenever you issue metals for manufacturing or receive ready ornaments from manufacturing (Artisan / Karigar / Smith), then ORNATE-2014 will allow you to maintain the stock balance of each Artisan in either fine weight or net weight. You can also choose to specify labour charges in either currency or metal (in the form of wastage). Artisan payments can also be made in either currency or metal. You can convert such outstanding from metal to currency or vice-versa by using the Fixing option of ORNATE-2014. Metal & Currency ledger is available in detailed as well as summarized format. It helps in balancing customer, supplier and artisan accounts on the basis of both metal and currency at a time. The Outstanding report (Metal & Currency) is very precise and in crisp format. All items can be tagged with plain computerized tags. All stock reports are available on gross weight, net weight or fine weight as per requirement. A separate, item-stock ledger report with wastage issue and wastage receipt is also available. To maintain stock of your real metal Jewellery, precious and semi-precious stone Jewellery, ORNATE 2014 provides studded Jewellery management functionality. Based on the above information, the software generates different reports having total stock, bifurcation of stock with metal and stone details as well as separate summaries of metal and stone stock, style wise and size wise stock. A separate report indicating gain & loss incurred from transactions based on fine metal is available with control report option. You can fix metal rates against any outstanding metal (i.e. conversion of your metal outstanding into amount) or you can fix metal rates against any outstanding amount (i.e. conversion of your amount outstanding into metal). Apart from Supplier / Customer outstanding, reports would include all reports right from cash book, bank book, journal, day book, ledger accounts to control reports like trial balance and Opening trial balance sheet. Apart from this, all registers like issue, receipt, sales and purchase are also prepared in pre-defined formats.